Carema is a town in the Canavese area of Piedmont bordering with the Aosta Valley, where Nebbiolo grapes are grown on pergolas, propped on stone and lime pillars, locally known as “pilùn”. The resulting Carema wine is intense and full-bodied. In 1967, it was awarded a Controlled Designation of Origin (DOC), now Protected Designation of Origin (DOP). Carema wine is named after a small town on the hills of the Turin province, where it is produced. 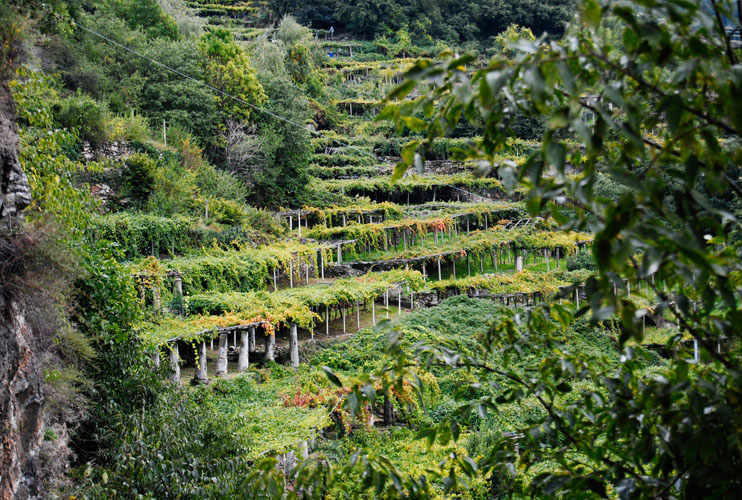 It is an intense and full-bodied red wine, obtained from Nebbiolo grapes solely, grown over a 16ha area within the boundaries of the municipality of Carema, inscribed in the DOC (now DOP) list since 1967. 8,000kg per hectare are harvested, of which 70% become wine. 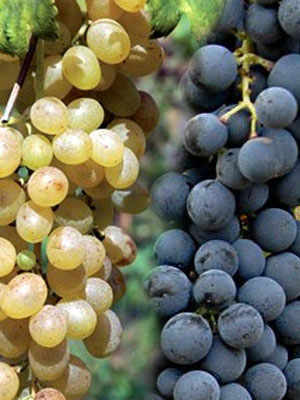 The production guidelines, as revised in 2010, allow two types of Carema: Classico and Riserva. Classico is aged for at least 24 months, of which 12 in oak or chestnut barrels. Ageing rises to a minimum three years, as far as Carema Riserva is concerned, of which twelve months in wood. Carema is garnet red, with a rosy smell and a soft, velvety and intense taste. The minimum alcohol content is 12%. A long-lasting wine, Carema can be aged even 20-30 years, if stored horizontally in a dark place and at a stable temperature. 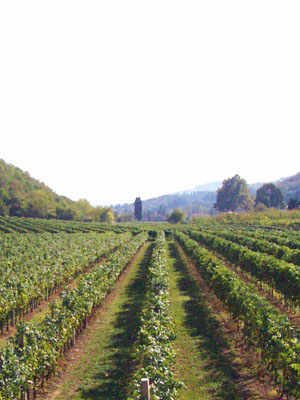 In 2013 two Nebbiolo-based wined entered the production guidelines: a champenoise-method sparkling rosé and Canavese Nebbiolo. Two further DOP wines produced are Canavese Rosso “Turel” and Canavese Rosato - also called “Tournet”. 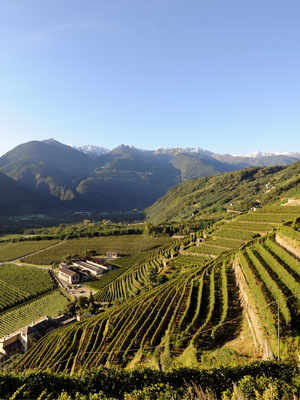 Production, preservation and aging of Carema wine must be carried out within the municipality of Carema, whereas bottling may occur in the city of Turin and the Aosta Valley, as well. 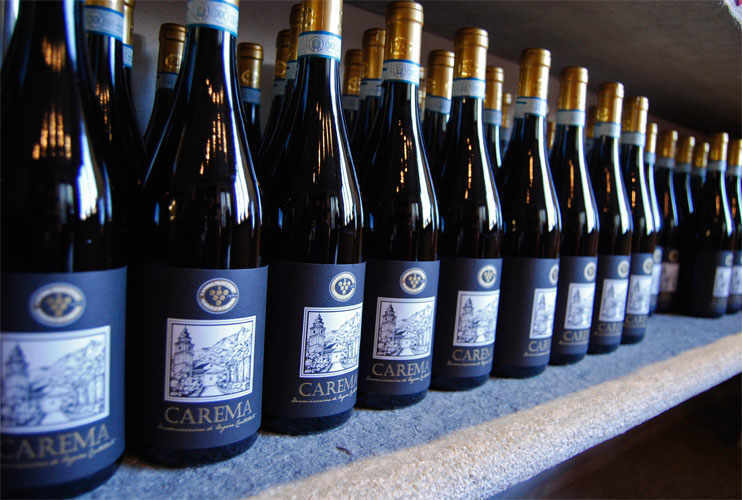 Carema Nebbiolo wine makers are engaged in public relations activities to raise awareness of the value of Carema wine, by means of product commercialisation and promotion activities and food and wine tours. 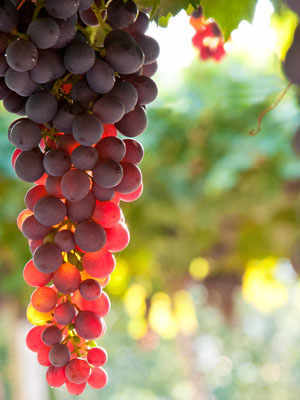 Carema wine is exported to Germany, Japan and the USA. It pairs beautifully with strong flavours, such as roast, game and red meat, as well as aged, mild cheeses. It can be enjoyed with a handful of nuts at the end of a meal, or in a luxurious moment of relaxation by the fireplace. It is best served at room temperature (18-20°C), possibly a few hours after decanting.